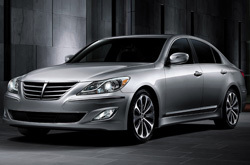 Make the most out of your next Genesis purchase by reading a review of the 2013 Hyundai Genesis before you buy. Vandergriff Hyundai is a well-known Hyundai franchise in Fort Worth for a reason. We provide you with reviews drafted by automotive writers at the height of their craft. This article will tell you exactly what you're looking for. As your Fort Worth Hyundai franchise, you can entrust on us for accurate information on the 2013 Hyundai Genesis. Read on, but don't hesitiate to contact Vandergriff Hyundai for more Genesis information. Compare the 2013 Hyundai Genesis next to vehicles like the 2013 BMW 5 Series, Lexus IS 350, Infiniti G37, Audi A4, Scion FR-S and the Mercedes Benz E550, and you'll see that the Genesis outshines the competition in several areas. Look through our Quick List below to find out why! Unlike megacorp auto centers, our Fort Worth car repair facility offers legitimate OEM parts, phenomenal Hyundai trained technicians and a gratis warranty for all services. We're also conveniently set near several neighboring cities. Keep your Genesis running dependably; have it serviced by Vandergriff Hyundai's skilled car repair associates. We handle challenging, tedious jobs like shock and strut repair, as well as manageable undertakings such as standard oil and filter changes, front and rear brake pad replacement and a gamut of specially requested services. Vandergriff Hyundai is your clear winner in Fort Worth for fast, professional Hyundai Genesis repairs and regularly scheduled maintenance. Get started on your next appointment by selecting a money-saving service coupon.